The unveiling of Kelso's new memorial garden last Friday. It’s been almost five years in the making, but Kelso residents now have a community memorial garden to help keep memories of their loved ones alive. The garden, featuring a stone wall already bearing seven names, was officially unveiled in the old part of Rosebank Cemetery last week. 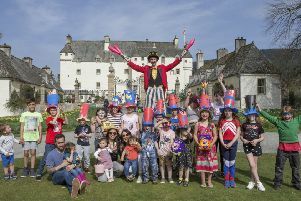 It was a day which had been a long-time coming for Kelso Community Council as former member John King first came up the idea five years ago. Its sub-committee, headed up by Harry Tomczyk and Kelso councillor Tom Weatherston, who took over the project from Alec Nicol, was responsible for sourcing space, funding and materials for the project. Mr Weatherson said: “This will be a great asset to Kelso, and people who have a loved one cremated will be able to have their names on the stone memorial without having to purchase a headstone of their own. The project was funded out of Scottish Borders Council’s small schemes budget and by donations local businesses. Town provost Dean Weatherston officially opened the garden last Friday, and he said: “We were extremely grateful to Morrison Construction, which donated about £5,000 worth of materials, Blinkbonny Quarry for donating concrete and aggregates, and to Forbes Technologies, which donated the gate and arch in memory of its managing director and chairman Lee Forbes, who died earlier this year. “Thanks also must go to Alistair Finnie and Stuart Young from Scottish Borders Council’s neighbourhood services who helped design the area and to the three men who did the work in creating a wonderful space. Last Friday, those contributors and members of Kelso Churches Together gathered at the memorial for an opening ceremony during which the Reverend Anna Rodwell gave a dedication and prayer. Robertson’s will manage the addition of any inscriptions on the memorial stone and those to be added to two further stones, and the community council will be responsible for the garden’s upkeep. A spokesman for Morrison Construction, contributing material through its community payback scheme while building the town’s new high school last year, added: “Morrison Construction are pleased to have been involved with Kelso Community Council with the planning and discussion process to allow the project to come to fruition, including the donation of building materials to the approximate value of £5,000 to allow the construction and completion of the Kelso community memorial.